In case you haven't heard, the Bird is the Word. And now it's also an entertaining game for your Android device. 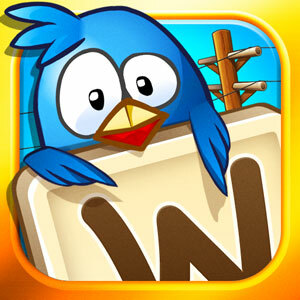 In Bird's the Word, the goal is to make as many words as you can, as fast as you can. Highlight the letters in the word and then enter it--the Submit button turns green as soon as you've created a legitimate word of three letters or more. When you do, the letters disappear and different ones take their places. The longer the word, the more points you get, and there are lots of special bonus letters that pop up as you go. There is a catch: Make sure that all the letters in the word are touching each other. If not, a sneaky bird will fill one of the spaces rather than a new letter. The more birds that perch on the board, the harder it will be make new words. Don't let the winged menaces thwart you! With this game you can create a flap three different ways. In Classic mode, you must fill up the score bar as quickly as possible to advance to the next level. To make it to the top of the pecking order, score more points at each new level within the same amount of time. With Timed mode, you try to collect as many points as possible before the clock runs out. Word Worm is a fun twist, where each new word must start with the last letter of the previous one. Remember that the early bird gets the worm--you only have 30 seconds to find each word. Think fast, bird brain. The game tracks stats such as longest word, average word length, time per word, and high scores for each game mode. The more you play and the higher you score, the more achievements you pile up: Word Warrior, Nesting Instincts, Squabble, Pest, Stunner, etc. As you go further into the game, you'll be able to unlock special birds and other features. Since birds of a feather flock together, you can also go beak-to-beak with your friends in Bird's the Word through Facebook. Just select Challenge on the main menu and pick out one of your friends. Then play a game in any mode and when you finish, a challenge will automatically be sent to your friend's wall. Can you soar with the eagles or are you going to end up hanging out with turkeys?